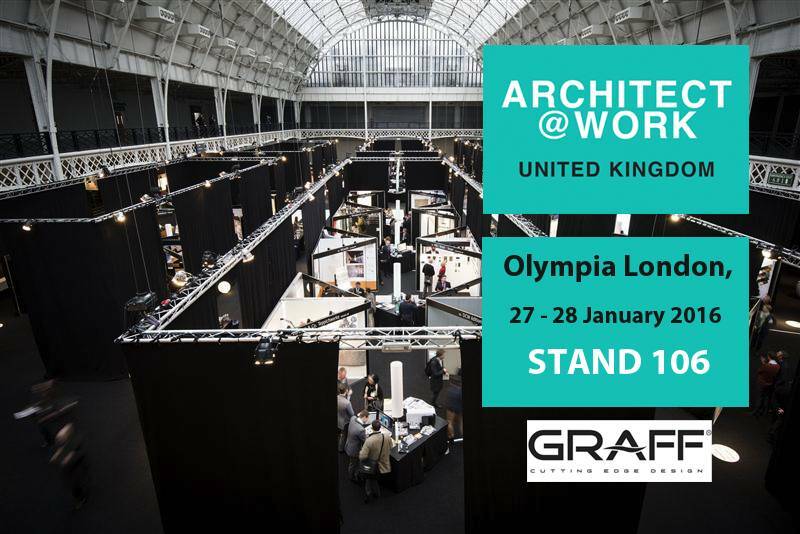 The unique and innovative exhibition ARCHITECT@WORK will be held in London at the end of the month, on Wednesday 27th and Thursday 28th, January 2016, at the Olympia Center. With its exclusive character and its strong focus on innovation, GRAFF, the American leading faucets company, will participate in the event, a few months after taking part in Architect@Work in Paris. GRAFF, globally recognized for its unique vision, will present its trend-setting products to all visiting architects and interior designers. Due to its extensive plumbing and hardware manufacturing experience, GRAFF has positioned itself at the forefront of design faucet creations for the luxury market. Utilizing the latest manufacturing technology and thanks to a tradition of oldworld craftsmanship, GRAFF’s commitment to creating cutting-edge, premiumquality collections is evident in each and every product. craftsmanship and experimentation. 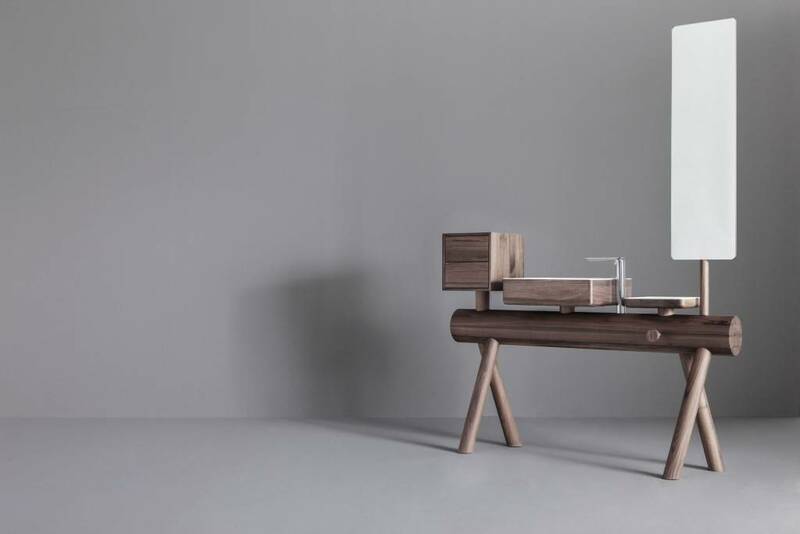 In London, at Architect@work 2016, the company will introduce its new creations dedicated to the world of the bathroom, able to interpret the design and the home space in a unique language, through new formal expressions. GRAFF will display the full range of three major projects that are born from the collaboration with Davide Oppizzi, Nespoli e Novara Design Studio and G+Design Studio. 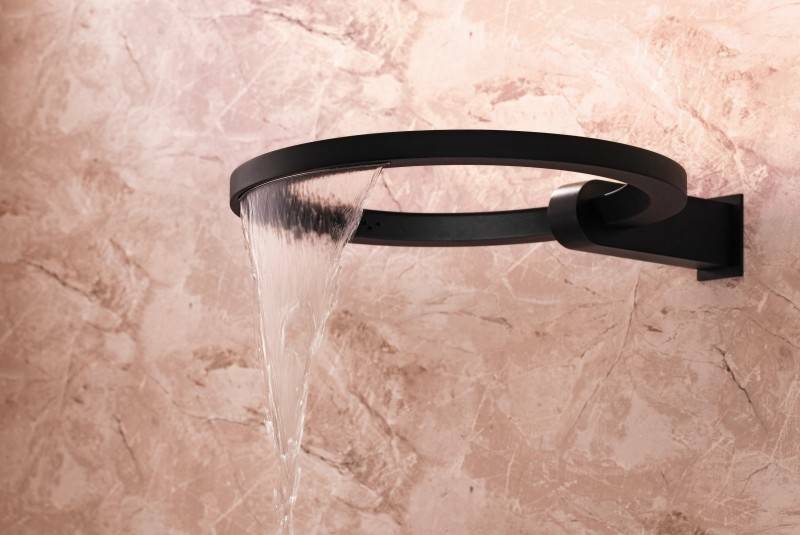 The first one is the award-winning Ametis Ring by Davide Oppizzi, the latest creation to complement the original design collection for the bathroom and the shower. Dressage, by Nespoli e Novara, is the second project, the first GRAFF furniture collection for the bathroom, manufactured in solid wood and DuPont ™ Corian®. combination of harmony and functionality: a product with unique qualities, strongly grounded on pure design and high-standard finishes. And Luna represents the perfect expression of such a perfect equilibrium..
Ametis Ring, winner of the Interior Design Best of Year Award in the Bath Fittings category, is certainly an avant-garde project, recognizable by its fluid design and light effect, a representation of the union between the universe and oceans; almost a futuristic “ode” to high design. On the basis of an online voting system administered by architects, design firms and internationally renowned designers, Ametis Ring was selected among over 2000 exclusive projects. items that reveal the deep connection between existence and the nature around us, in which the intrinsic value of the objects, inherent in matter, transfers emotions to be enjoyed each and every moment. Drawing inspiration from his experience with water and colors, from the waves movement and from the old tradition of Japanese typography, executed with a single brush stroke, this new collection transforms water, such a precious element, in a hymn to purity that allows you to get closer to the most intimate expressions of the soul. Ametis Ring is a simple but, at the same time, very refined object: the project incorporates many features of high-tech engineering and uses a full-spectrum LED RGB color therapy lighting system with 6 colors. 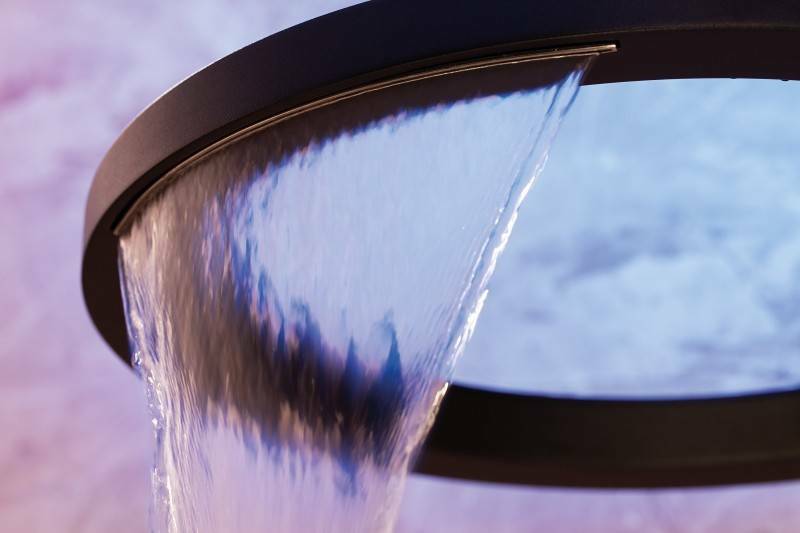 The showerhead main body, completely empty inside, is internally designed so that the rainfall flows in a perfect angle, merging exactly below the center of the ring. Manufactured in steel, for a long life guarantee, Ametis Ring integrates a LED system that gives the object a new dimension, thanks to indirect light, a still not widely used concept in bathroom design. 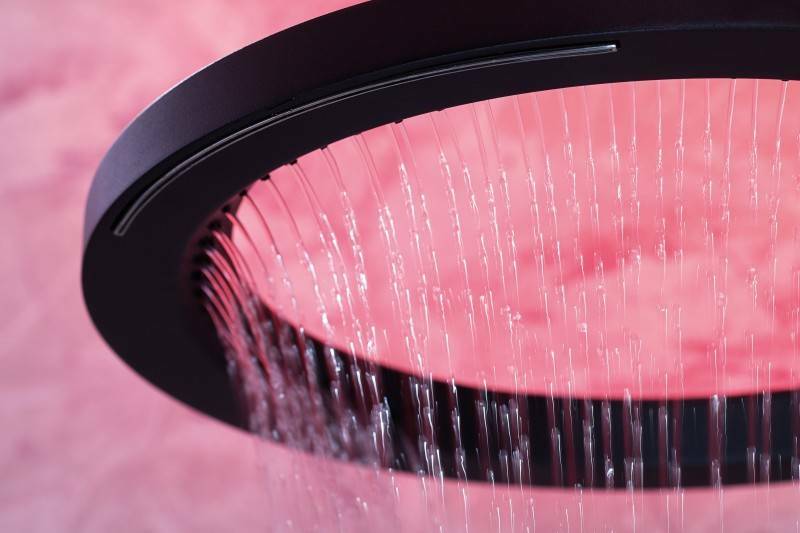 The showerhead has two distinct functions: the user can easily switch from the “rain” effect to the “waterfall” jet. Available in chrome, matte black and matte white (both obtained through a powder coating process). 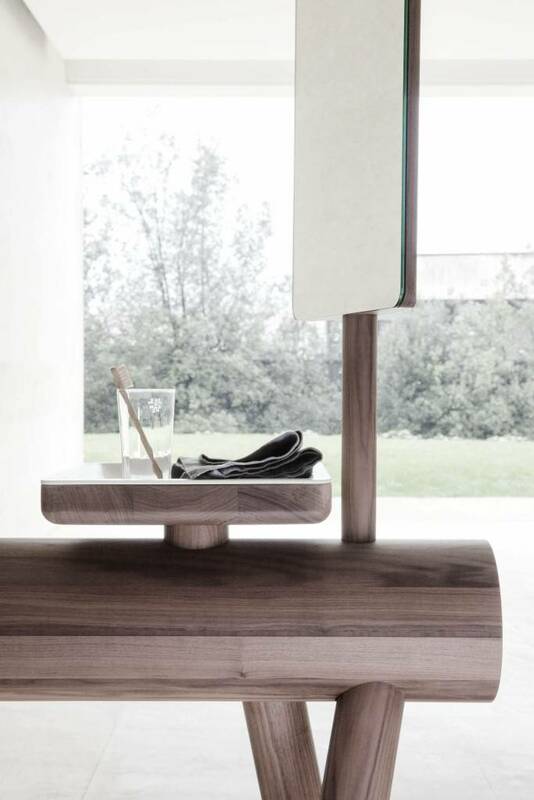 From the creative hand of designers Nespoli e Novara, Dressage is a collection of furniture with a strong handicraft and manufacturing element, where the warmth of tradition, transmitted by the use of solid wood, meets with the functionality of an innovative material such as DuPont Corian®. The strong artisan component represents one of the distinctive elements of a collection designed for the bathroom but inspired by the world of interior design. Dressage is harmony, geometry, versatility. 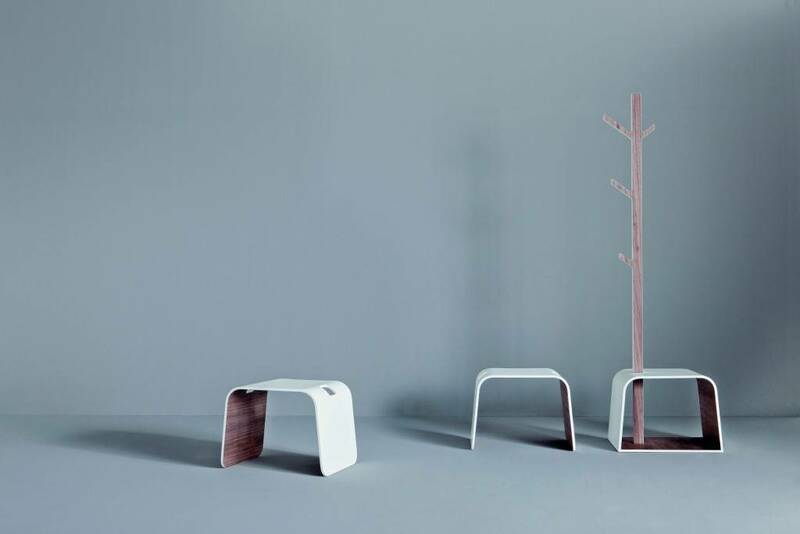 The main furniture piece is a freestanding unit in solid wood, compact and functional. All the elements for the water supply and discharge are housed inside, invisible from the outside. 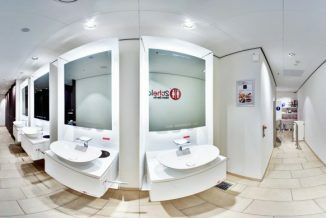 It can be equipped with a sink in solid wood and DuPont ™ Corian® and accompanied by a shelf, a towel hook, a set of drawers and a rotating mirror. 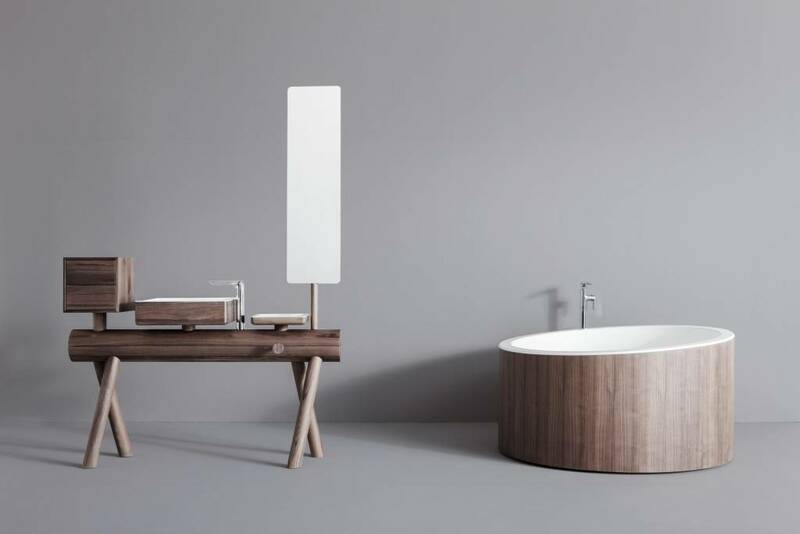 The tub is constituted from a sheet of thermoformed DuPont ™ Corian® coupled with solid wood. Its transverse cut creates an invitation to enter and the higher zone allows the user to stretch and relax. The tub is designed to live in the center of the room space, in its free-standing version with head-rest and a shelf for holding cosmetics. coordinated elements: the stool and the clothes hanger. Each object is selfsufficient and versatile and can become part of an overall theme that can be gradually composed over time, involving the main rooms of the house. Dressage is available in the following finishes: Canaletto walnut, oak, wenge, matte white. 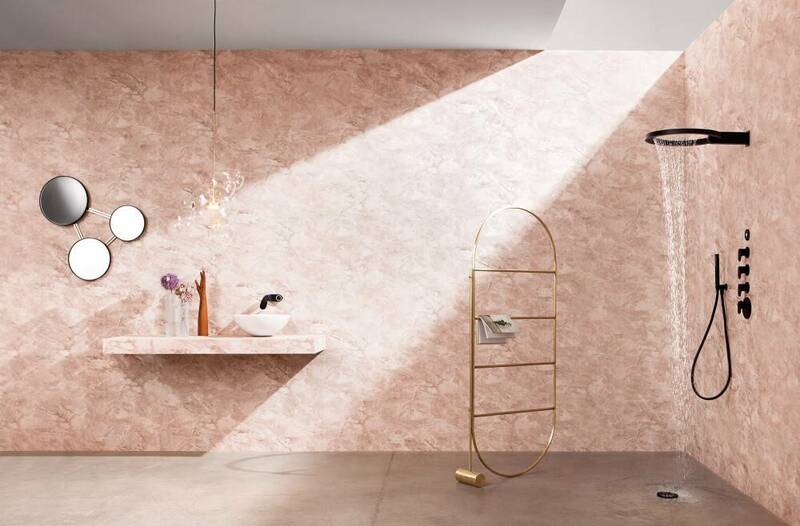 Luna evokes a celestial form: an element that shines with its ethereal features in the bathroom, showing its perfection, a sinuous element that floats gently on the wall. GRAFF know-how and engineering capabilities have allowed the development of an impeccable chrome finish, far superior than the average quality available on the market. The collection is also available in the special Steelnox® finish, perfectly fingerprint-proof and very high performing. The powder coating process, in fact, makes the finish extremely resistant to scratching and chipping as well as to abrasions, corrosions, discoloration and other problems of wear. Winner of the prestigious Interior Design Best of Year Awards in the Bath section, Luna’s singular design is supreme not only for its distinctive shape, but also for the mirror-like finish, which gives its surface a highly reflective effect. 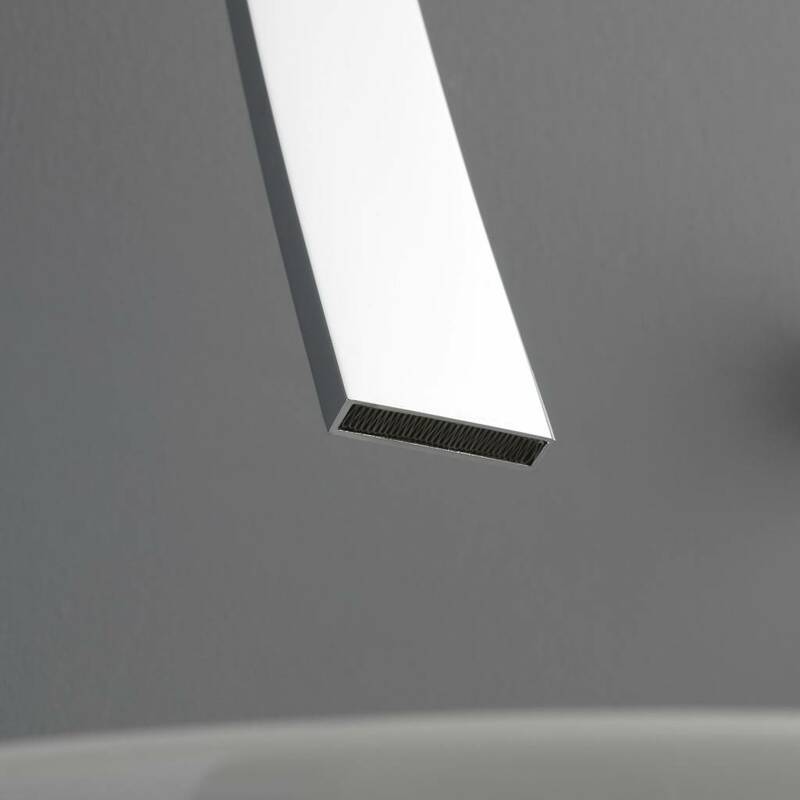 Equipped with an aerator, the Luna faucet has a flow rate of 18 liters per minute with a 3 bar pressure. 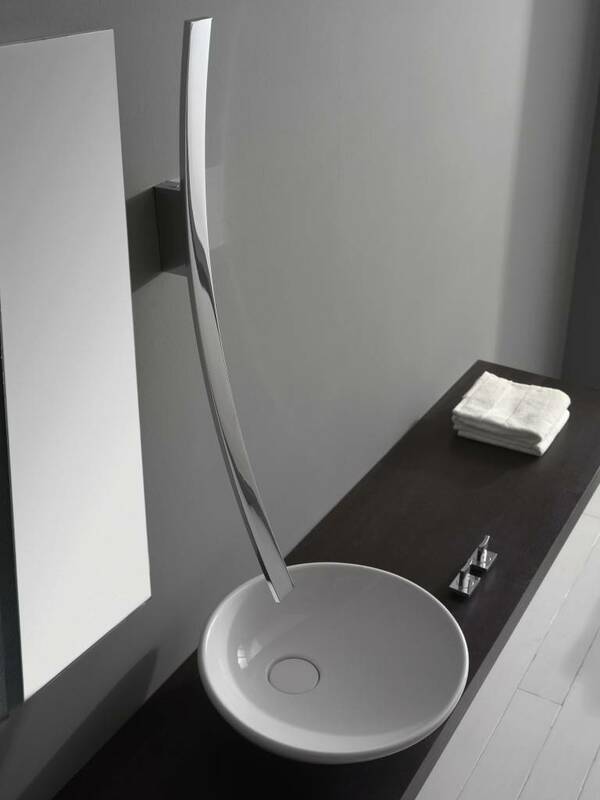 Available with wall-mounted or deck-mounted handles as a lavatory faucet, the collection includes also an original shower column recalling the curve of the spout.